life-force that transforms an ideal product into perfection.Ormus is blended into pure distillates of organic neroli, rose and sandalwood infused with pure Goji berry extract abundant in skin beneficial polysaccharides, antioxidants and flavonoids. Goji berries arealso a rich plant source of Ormus. Dunaleila salina algae from Hawaiian waters is added for it’s nourishing and protective peptides which stimulate cellular energy (ATP) and encourage rapid cell renewal. Ahnfeltia concinna (Hawaiian red algae) is included to help increase elasticity and skin firmness, stimulate collagen synthesis, reduce skin redness and irritations and improve hydration. Olive-derived sodium hyaluronate deeply hydrates by holding water in interstitial tissue. A special wheat germ extract has a calming effect on inflamed or irritated skin. 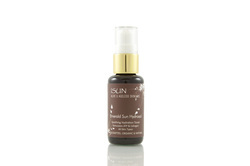 A high hydrogen ion, silica-magnesium mineral complex synergizes with ormus elements to enhance cell metabolism for skin repair and regeneration.The rejuvenating effect of Emerald Sun Hydrosol for all skin types is a renewed radiant, translucent, calmer, more even-toned, hydrated complexion that becomes more youthful with each day of continued use.